The last entry is for yesterday’s CDMS paper, which shows two candidate events surviving all analysis cuts, set prior to looking at the result (unblinding). The probability for background fluctuating up to account for these two events is 20-23%, so no one is calling it a signal. Both are close to the edges of the analysis cuts, so even if the observed events had significantly exceeded the background estimates, there would be room for doubt. This may be the tip of the iceberg for direct dark matter detection, but then again, it may not. 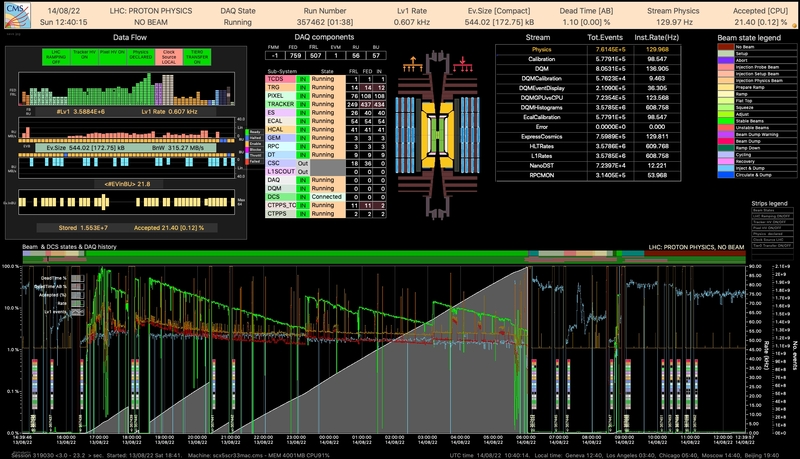 Earlier today, the LHC finished its 2009 run. They did everything they said they were going to do: provide physics-quality 900 GeV collisions and break the world record by colliding protons with a combined energy of 2.36 TeV (that happened Monday), as well as many other studies to make sure that everything will work for 7 TeV collisions next year. We’ve been busily finding the familiar particles of the Standard Model— I wrote two weeks ago about the re-discovery of the π0; since then new particles been dropping in almost daily. I’ll explain some of the already-public results below the cut, but first I want to point out that there will be another LHC Report this Friday at 12:15 (European Central Time = 6:15 AM Eastern U.S. = 3:15 AM Pacific) on CERN’s webcast site. This is where all of the LHC experiments will present their results and probably make a few more public. Also, in case you haven’t heard, there have been a lot of rumors that the Cryogenic Dark Matter Search (CDMS) has discovered something interesting. They’ll be presenting whatever it is tomorrow with a paper on the arXiv, a Fermilab presentation at 4:00 PM Central U.S. (webcast here), and a SLAC presentation at the same time, 2:00 PM Pacific (webcast here). It might be the direct detection of dark matter particles, which would be incredibly exciting. A little over a year after the highly publicized start-up and break-down of the LHC, the damage has been repaired, new protection systems are in place, and all sectors are cold and ready for beam. Yesterday, the first injection test of 2009 was completed— beams of protons and heavy ions were successfully threaded into the LHC beampipe from its predecessor, the Super Proton Synchrotron (SPS). The beams were allowed to flow as far as the first experiments in both directions, ALICE on the clockwise side, LHCb on the other. Leaning on a Chinese restaurant at a busy street corner in Greenwich Village, I crossed my legs, tipped my hat low, and quietly panicked. This case is turning into a nightmare: dozens of suspects, growing daily, and they all seem to swap places when you’re not looking. A pion couldda done it; pions seem to be some kind of front for the nuclear force that Madame Curie was playing with before she died. But leave a pion to itself and it disintegrates into a muon and a neutrino, neither of which claims to have ever heard of nuclear forces. Radiation in the form of muons and neutrinos has been raining down on us since the beginning of time, and it’s never even hurt. If pions are just glowing with nuclearness, where does the nuclearness go when they die? For that matter, what is a particle, anyway? I have to admit, I wasn’t suspicious when I first heard the word— I thought they were talking about little rocks or marbles or something. But rocks don’t just change into different kinds of minerals on their own, except for Curie’s rocks, that is. What are these particles? The physicists themselves don’t seem to know: everyone I ask gives a different answer. They seem to be some shadowy energy-clouds, sometimes insubstantial and sometimes infinitely hard. What kind of world are we living in, anyway? “Are you looking for Madame Wu?” The young man startled me. From the high-necked sweater and the pipe in the corner of his mouth, I’d reckon he was a student. After a wrong turn in Albuquerque, I caught up with Bugs Bunny, alias Richard Feynman, somewhere near the ends of the earth. Up to my elbows in snow-drifts, I spied on the little window to his office, in which he seemed to be doing normal professor-things, plus wild gesticulations. I decided on a particularly frozen morning that I would have to risk visibility if I was to get answers, so I enrolled at Cornell, posing as a G.I. bill student. In Professor Feynman’s introductory physics lectures, I could see that there was something remarkable happening here. People researching physics is about as natural as fish studying water: it’s the very stuff we’re made of. He had a knack of getting down to the ground floor, asking the basic questions, just as much in a block sliding down a plane as in neutrinos. I should have sought Dr. Fermi right away, back when it was easy. When Mademoiselle Curie gave me the lead, Enrico was a quiet university professor in Rome. Since then, he’s got a lot harder to find, and it seems that the professor has government ties— secrets as big as the men who hide them. I chanced upon a tip leading me to a project in Manhattan, and though I found Fermi on the books as a Columbia professor, I had just missed the man himself. Asking an associate about where in the New World this Italian Navigator might be, he turned bright red and insisted that there was absolutely nothing in the basement. Nothing at all. So Enrico wasn’t content to let atoms do all of the dirty work— this cat shoots back! I took a look at the hands, still and limp on the bed. They were hardened, calloused, deeply burned and thick-skinned. “What is this?” I asked myself, but I must have said it out loud because Eve heard me. A cup of tea and now dead? That didn’t sound good. “Poisoned?” I asked. I never mind stating the obvious. In my previous post on card shuffling, I established a basic framework in which we will work. We are given a probability distribution on and we wish to determine when first begins to decay exponentially, where is the -fold convolution of One key feature of card shuffling theory, as well as much of finite Markov chains in general, is that the tools available are often very particular to a small class of problems. There just aren’t very many big hammers around. Even though the theorem described in the previous post was quite general, it was non-quantitative, and so not especially useful in practice. First Way. The first thing to think about is how we cut the deck. Mathematically speaking, we will assume the number of cards in the top half of the deck after we cut is binomially distributed. All this means is that to determine the number of cards we cut from the top, flip 52 coins and count the number of heads to figure out how many cards go in the top half. It may seem strange that there is a positive probability of having all 52 cards in the deck sitting in the “top half” but the probability is extremely small and so doesn’t matter so much. For most shufflers, the size of the two “halves” are often quite different. Anyway, suppose that our result is cards in the top half. From here, we think of having 52 boxes lined up and put the cards in them. We pick of the boxes (assuming each box is equally likely) and put the top half of the deck in those boxes, keeping them in the same order. Put the remaining cards in the remaining boxes, keeping them in the same order relative to each other. Stack the cards back up. Note that there are ways to put cards in 52 boxes, so that the probability of any box choice is .